INSP January 2012 Schedule with Happy Days; Tonight Show Gives A Lucky Member of The Air Force To Appear On Whitney and Are You There, Chelsea? Just last week we told you that Happy Days and Little House on the Prairie are joining the INSP January 2012 schedule, but now we have the full January line-up! We know that Happy Days will be airing weekdays at 6:00pm & 6:30pm ET starting Jan. 2, bit you'll be glad to hear that The Brady Bunch will now air weekdays at 5:00pm & 5:30pm ET as a lead-in! 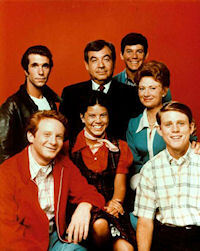 The schedule will start on Monday, Jan. 2 and the line-up will kick-off at 1pm ET with The Waltons every weekday. Then at 2pm ET, it's Wind At My Back. Then at 3pm ET, The Big Valley remains, but its 4pm ET slot will now be the new addition Little House on the Prairie. As mentioned, the sitcoms will air in the 4pm & 6pm ET hours, so Dr. Quinn will be moved to 7pm ET, as Wind At My Back moves to 2pm ET. In primetime, The Waltons remains at 8pm ET, but the second hour will now be Little House on the Prairie at 9pm ET. Then another hour will follow at 10pm ET, leading into Dr. Quinn at 11pm ET, which will remain. And finally for weeknights, The Big Valley remains at 12 midnight and will also gain the 1am ET hour replacing Our House, which will be removed from the schedule for now. Moving on to weekends, we mentioned Little House joins the line-up with a New Year's Day marathon on Sunday, Jan. 1, but the following weekend will have some changes. On Saturdays, Little House will be airing at 7pm ET, while Bonanza and The Big Valley remain from 12-2am ET. And finally on Sundays, The Waltons and Little House will air Sundays from 1-3pm ET replacing back-to-back Dr. Quinn. Every other timeslot we have not mentioned is an inspirational, gospel, or other type of series. NBC's The Tonight Show with Jay Leno offered its all-military audience on last Wednesday's show (November 23) an opportunity to win a guest role on the upcoming new network comedy Are You There, Chelsea? and current comedy Whitney. Each branch of the military were given an audition and the best performance won a cameo role in an upcoming episode of Are You There, Chelsea? and also a guest role on the Whitney Cummings sitcom Whitney. Whitney Cummings, along with Tonight Show correspondent Ross Matthews, served as the judges for the competition. Cummings replaced Chelsea Handler who was originally supposed to be one of the judges, so with Cummings appearing, they added Whitney to the prize. After the competition, the winner was Marcus McGinnis from the Air Force. Marcus will have a speaking guest role on Whitney on an episode this season and will have a cameo on Are You There, Chelsea. Both sitcoms will air back-to-back on Wednesday nights starting Wednesday, Jan. 11, 2012 from 8-9pm ET on NBC.